Consider the following figure from Faraway's Linear Models with R (2005, p. 59). The first plot seems to indicate that the residuals and the fitted values are uncorrelated, as they should be in a homoscedastic linear model with normally distributed errors. Therefore, the second and third plots, which seem to indicate dependency between the residuals and the fitted values, suggest a different model. But why does the second plot suggest, as Faraway notes, a heteroscedastic linear model, while the third plot suggest a non-linear model? (where the expression on the left is the variance-covariance matrix between the residuals and the fitted values) this would explain why the second and third plots agree with Faraway's interpretations. But is this the case? If not, how else can Faraway's interpretations of the second and third plots be justified? Also, why does the third plot necessarily indicate non-linearity? Isn't it possible that it is linear, but that the errors are either not normally distributed, or else that they are normally distributed, but do not center around zero? The second plot shows the mean residual doesn't change with the fitted values (and so is doesn't change with $x$), but the spread of the residuals (and hence of the $y$'s about the fitted line) is increasing as the fitted values (or $x$) changes. That is, the spread is not constant. Heteroskedasticity. the third plot shows that the residuals are mostly negative when the fitted value is small, positive when the fitted value is in the middle and negative when the fitted value is large. That is, the spread is approximately constant, but the conditional mean is not - the fitted line doesn't describe how $y$ behaves as $x$ changes, since the relationship is curved. Isn't it possible that it is linear, but that the errors are either not normally distributed, or else that they are normally distributed, but do not center around zero? Not really*, in those situations the plots look different to the third plot. (i) If the errors were normal but not centered at zero, but at $\theta$, say, then the intercept would pick up the mean error, and so the estimated intercept would be an estimate of $\beta_0+\theta$ (that would be its expected value, but it is estimated with error). Consequently, your residuals would still have conditional mean zero, and so the plot would look like the first plot above. (ii) If the errors are not normally distributed the pattern of dots might be densest somewhere other than the center line (if the data were skewed), say, but the local mean residual would still be near 0. It doesn't "seem" to, it does. And that's what heteroskedastic means. Then you give a matrix of all 1s, which is irrelevant; correlation can exist and be less than 1. Also, why does the third plot necessarily indicate non-linearity? Isn't it possible that it is linear, but that the errors are either not normally distributed, or else that they are normally distributed, but do not center around zero? They do center around 0. Half or so are below 0, half above. 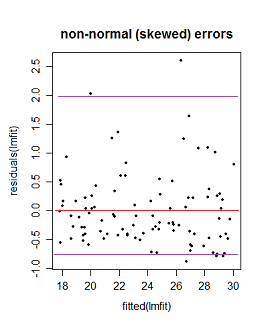 It's harder to tell if they are normally distributed from this plot, but another plot that is usually recommended is a quantile normal plot of the residuals, and that would show whether they are normal or not. Not the answer you're looking for? Browse other questions tagged regression residuals assumptions graphical-model or ask your own question. Trying to understand the fitted vs residual plot? How to test for independence of residuals in linear model? What does the residuals vs fitted regression line express? What resolution should I be using for residuals vs fitted values plot from a linear regression? 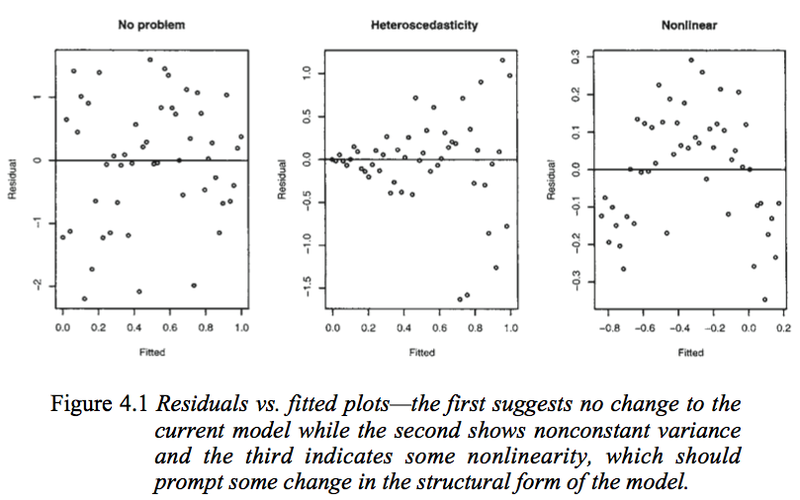 Residual plots: why plot versus fitted values, not observed $Y$ values? residuals increases with fitted values : what kind of model misspecification might it indicate?